So I was out in Oregon this past week, on the first of four legs of the media tour for my newly released book, The Harvest Baker. It’s been several years since I’ve flown anywhere, so this trip was a vivid reminder of why modern air travel ranks right up there with heart attacks and tooth extractions on my personal fun-o-meter. I don’t mean to whine. And I am grateful that no fists or even cross words were exchanged between my fellow passengers. Noses were not bloodied and no one was dragged off the plane by surly air marshals. That being said – and especially when one is 6’ 5” tall – it’s not difficult to understand how frustrations can begin to simmer after four and one half hours in a winged sardine can. First let’s acknowledge that your typical airline seat is designed for an undernourished individual less than five feet tall. Factoring in the length of my legs and close proximity of the seat back in front of me, my knees were stationed roughly four inches from my mouth for the entire flight, and in my mouth when the good woman in front assumed the reclining position for her afternoon nap. Claustrophobic does not begin to describe the situation. My wife and I don’t sleep that close together. But in the end it was all worth it, of course. Oregon is a lovely, friendly state and it was my great pleasure to give two harvest baking presentations at the Mother Earth News Fair in Albany, where I was heartened to learn that the self-sufficiency movement that sprouted up in the sixties is alive and well. Judging by the crowds and well-attended talks and workshops, alternative energy, food preservation, gardening and small scale farming, hands-on home construction, chicken keeping, herbal wisdom, and wholesome cooking are as relevant today as they ever were. 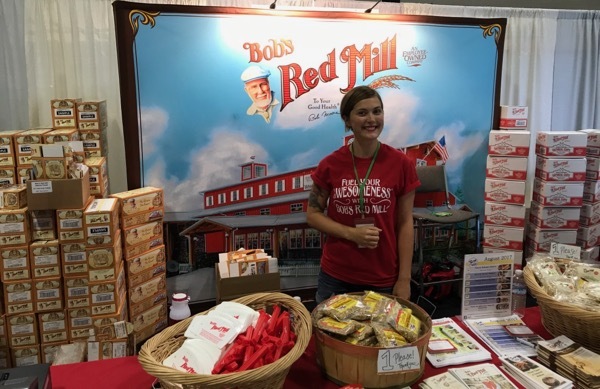 Bob’s Red Mill – a big name in whole grains – at the Mother Earth News Fair in Oregon. Nice folks! 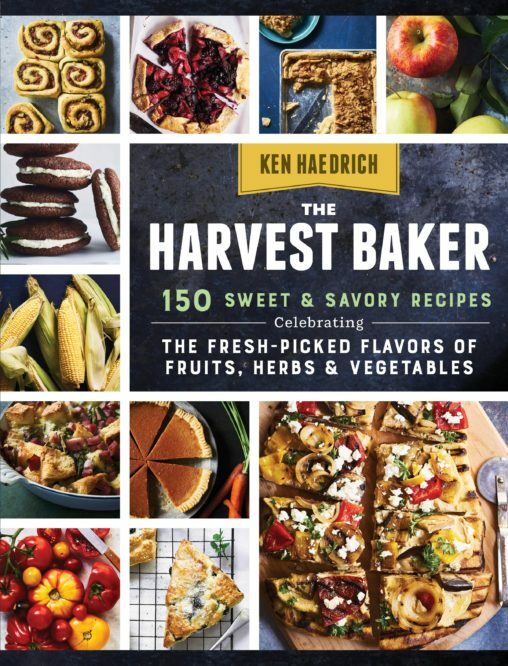 Before leaving Portland early in the week I stopped by TV station KATU to film a live segment for a recipe you’ve seen here before, the Tomato Slab Pie from page from page 195 of The Harvest Baker. The host and studio crew absolutely flipped for it. The cameraman made several trips back to the green room after my segment to ask for seconds and thirds. You can watch the segment here. I’ll close by introducing another recipe (below) from The Harvest Baker that’s proving, if my emails are any indication, to be a real hit – Blueberry Cream Scones with Mint Sugar. Local blueberries may be getting scarce where you are, but try to find a pint somewhere so you can make these before summer’s end. They’re buttery-and-creamy rich, with a texture like dense coffeecake, and blueberries in every bite. I know you’ll approve. 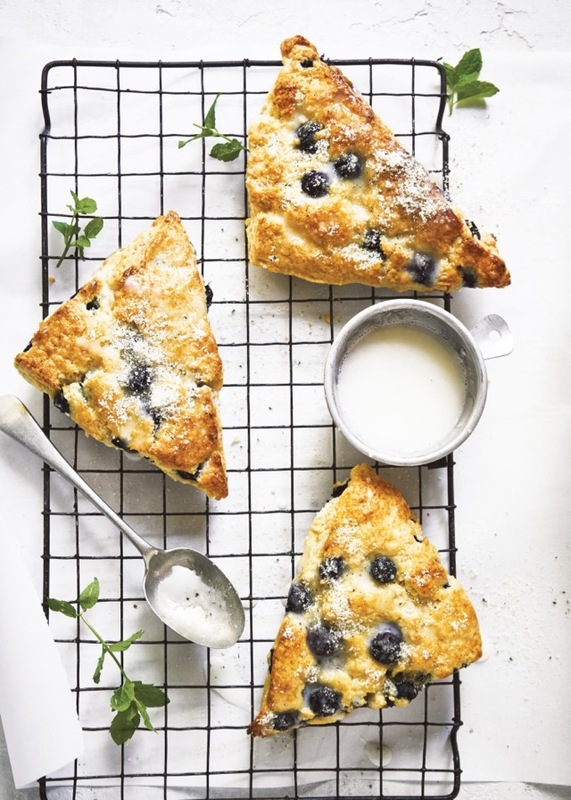 RECIPE NOTE: The Blueberry Cream Scones recipe calls for confectioners’ sugar glaze. If you’d like to use it – it helps hold the mint sugar in place – use the one here that I put on the Blueberry Cream Cheese Pound Cake. Incidentally, both the glaze and the mint sugar are essentially optional, but I love them. You could certainly use the glaze without the mint sugar, if you prefer. In case you’re relatively new to The Pie Academy, the Pie Getaway is our signature annual event where a handful of members convene in Charleston, S.C. for a weekend of hands-on pie making instruction mixed with good fun and fast friendship between kindred spirits. 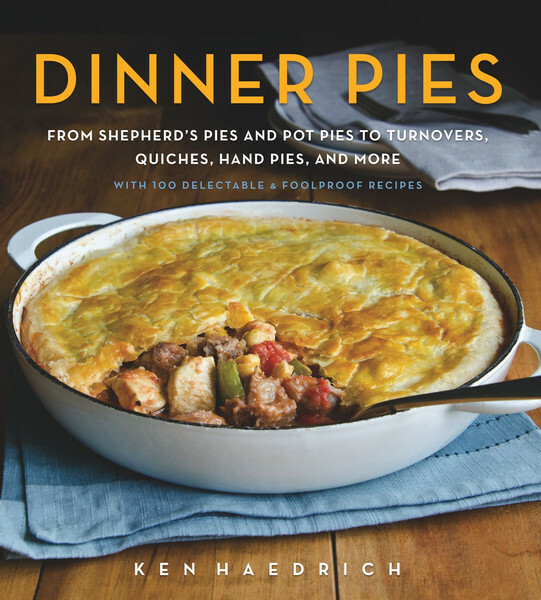 We quickly become one close, extended family, united in our passion for pie and good old fashioned hands-on baking. I’m happy to tell you that if you’d like to join us, we still have a couple of openings. Perhaps this is the first you’ve heard of the Pie Getaway…or maybe your schedule has opened up since it was first announced. 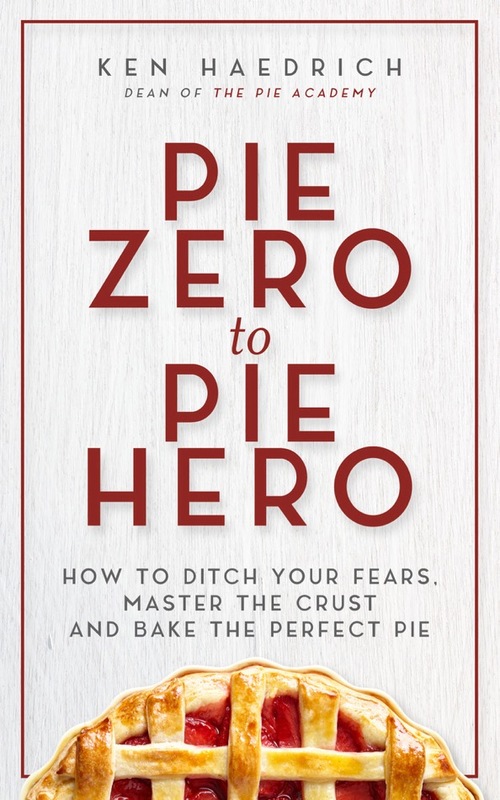 Whatever the case, if you have any questions, feel free to email my wife Bev – bev@ThePieAcademy.com – and we’ll get back to you. We’d love for you to be a part of this unforgettable experience. If your blueberries are fresh, an hour before you plan to bake these - or the night before - put your blueberries on a plate and place them in the freezer to firm them up so they don't burst and leave streaks in your scones. Preheat the oven to 425°. Line a large baking sheet with parchment if you have it, or butter the sheet lightly. Combine the flour, sugar, baking powder, salt, and nutmeg in a large bowl. Mix well with your hands or a whisk. Add the butter and gently toss it with the dry mixture to coat the fat. Using a pastry blender, cut the butter into the dry ingredients until it is broken into split pea-size pieces. 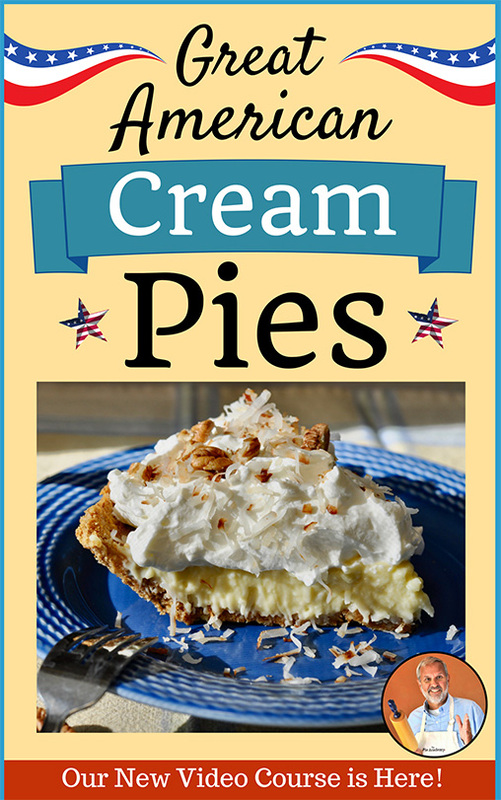 Combine the cream, egg, lemon extract, and vanilla in a measuring cup; stir to blend. Set aside 2 teaspoons of this liquid to brush on the scones. Make a well in the dry mixture and add the rest of the liquid mixture. Mix gently with a few strokes, then add the blueberries. Stir, using as few strokes as possible, until the dough forms a shaggy, cohesive ball. Scrape the dough onto a well-floured work surface. Place a sheet of plastic wrap on top of the dough and press it into a 3/4-inch-thick disk. Use a rolling pin if you like to even it out. Either way, press gently to do as little damage as possible to the berries. Remove the plastic and cut the disk into six or eight wedges with a knife or dough scraper. Transfer the wedges to the baking sheet, re-creating the circle but leaving about 1/8-inch between the pieces. Brush the scones lightly with the cream glaze. Bake for about 25 minutes, until they're swollen and a rich golden brown. Transfer the baking sheet to a cooling rack, and cool for 5 minutes. Cut the scones apart and set them directly on the rack. When the scones are still slightly warm, drizzle them with the confectioners' sugar glaze. If you're using the mint sugar (see below) sprinkle it on soon, before the glaze forms a skin. Refrigerate leftovers. To reheat the scones, place them on a baking sheet, cover loosely with foil, and place them in a 300° oven for 10 minutes. Makes 8 servings. Mint Sugar - Combine 1 small bunch mint leaves - rinsed and patted dry - and 1 cup sugar in a food processor. Pulse until the leaves are finely chopped, virtually as fine as the sugar. Store leftovers in a sealed jar. The moisture in the mint will cause the sugar to clump, so shake or mix regularly to keep it clump free.